The leaves have tiny teeth on the edge around the entire leaf. Curly-Leaf Pondweed gets its name from the rippled or wavy nature of its submerged leaves. The leaves are a half inch wide and 2–3 inches long with tiny teeth along the edges. It can grow flowers in the late summer which grow out of the water. 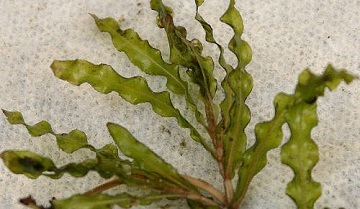 Curly-Leaf Pondweed appears reddish–brown in the water but is actually green when observed out of the water. Commonly found in the Midwest, but is distributed throughout the entire U.S. Since this species is invasive, avoid transfer of any plant material to other bodies of water. Dibrox can be used to treat curly-leaf pondweed. You can order these products on this website.